Whether you’re replacing the siding on your home, installing siding on a new build, or simply painting your current siding, you may be overwhelmed at the color options out there. After all, there are thousands of options and combinations to consider. So how do you pick the right option for your property? Well, if you find yourself idly standing in the aisles of your local hardware store, staring at swatches and colors, we have some advice to get you started. We’ve catalogued a few tried and true siding color combinations that you can consider for your home. Take a look at a few of our favorites below — all of these options are quite traditional, and they look good on most homes. 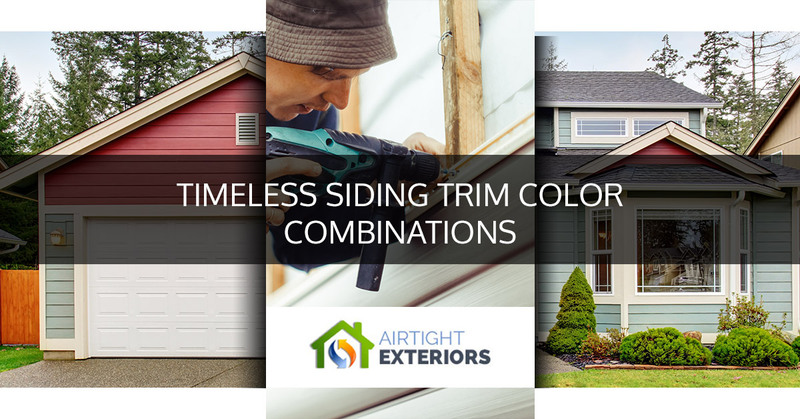 Oh, and if you’re still stuck, you can always reach out to the siding experts here at Airtight Exteriors — we’d be happy to help guide you to the best color options for your home and your preferences. Yellow is a time-tested siding color for homes thanks to its welcoming appeal. Yellow is considered to be innocent, warm, and inviting, making it an ideal color for home facades. If you’re considering yellow for your home, you may want to go with an off-white trim and accent color. You can also opt for bold primary colors to make specific features of your home pop. Consider painting your front door red, for instance, or opt for blue shutters for your windows. There are a number of yellows that work well for home facades, ranging from light yellows to darker, pale yellow. Pale yellows tend to look better for larger homes, where they don’t overwhelm the overall aesthetic of the abode. For smaller homes, you can get away with any yellow on the spectrum. A pale blue is a quiet, unassuming choice, making it an ideal option for those who can’t decide on a siding color. This color looks clean and can be paired with a variety of trim colors to make your home composition look whole. Plus, you can still add accent colors to the exterior of your home. It won’t look out of place to have a dark purple front door, or bright white accents. With blue-grey for the majority of your home’s exterior, the accents, trim, and other features of your home will pop out, which will prove pleasing to onlookers. Blue-grey also looks great paired with stone, and it looks excellent with red brick, or even brick that has been painted white. Pale greens work just the same as blue-grey, in that this fairly neutral tone will make the accents and features of your home pop out. Green-grey is also a great choice for homes that are surrounded by foliage throughout their landscape. If, for instance, your home is fronted with rose bushes, the red blossoms will be highlighted against the neutral green of your home’s siding. Also, consider greenish grey siding if you have natural structural elements around the exterior your home (e.g. wood posts, stone half-walls, etc.). As a natural tone, pale green siding will compliment the organic look of your home. While red and white may make a home look too much like a barn, this combination can prove ideal for small homes, and for homes that have a fair amount of acreage. If you have a smaller home, red siding and white trim will make your home pop out from the rest of the crowd. This choice excites the eye, and it can prove to be a tasteful option in neighborhoods where homeowners have siding of all sorts of colors. If you have a home with plenty of open space surrounding it (which is to say that there aren’t any homes nearby), then red and white will prove to be a bold choice to make your home look impressive against its surrounding landscape. You’ll also love how bushes and trees look against a red backdrop, and you can even consider growing vines up and across the surfaces of your home to make the composition even more impressive. Like yellow, light blue is an innocent looking color, and it’s inviting to those walking up to your front steps. You’ll love how simple and appealing light blue looks on your home. Combine light blue with an off-white trim to keep your home bright and weightless, or add in a bit of accent color to make your home more expressive. You could put in a firetruck red door, or you can paint your shutters a dark, coastal blue. You can even incorporate browns, greys, and other neutral tones throughout your home’s exterior composition — the boundaries are truly limitless here! While pure white may be overwhelming for a whole home (and it can get dirty easily), off-white is a modest choice that looks great in any setting. For homes of any size, with trim of nearly any color, off-white proves to be a viable option. If you’re truly on the fence about your siding choice, you can play it safe with an off-white tone. Off-white siding is sure to retain its value as well, should you ever decide to place your home on the market. Similarly, neutral tones are a safe bet. Like off-whites, neutral tones work with many trim and accent colors, and they’ll quietly improve the overall look of your home. These calming, natural tones work well with any and all landscaping features as well. For the ultimate adaptable choice, you can select a few neutral tones to complete the siding and trim of your home. Ready to get started? 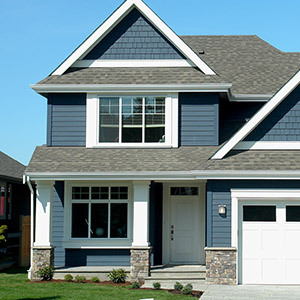 Or still can’t decide on the best color options for your home siding? We’re here to help. Reach out to us for a quick quote for your project, or if you need some advice on your upcoming siding installation. Here at Airtight Exteriors, we’re proud to work throughout Lakewood and the Denver Metro area providing siding and window installation services, and we hope to serve you!